The 1970-1971 Plymouth ‘Cudas are the best muscle cars. Yeah, that’s sort of a sweeping statement (and entirely opinion)… but it’s true. We’ve featured a 1970 Hemi ‘Cuda and a ’71 Hemi ‘Cuda Convertible (and a ’70 ‘Cuda Convertible that is supposed to look like a Hemi), but never a ’70 Hemi ‘Cuda Convertible. Which is what this car is. 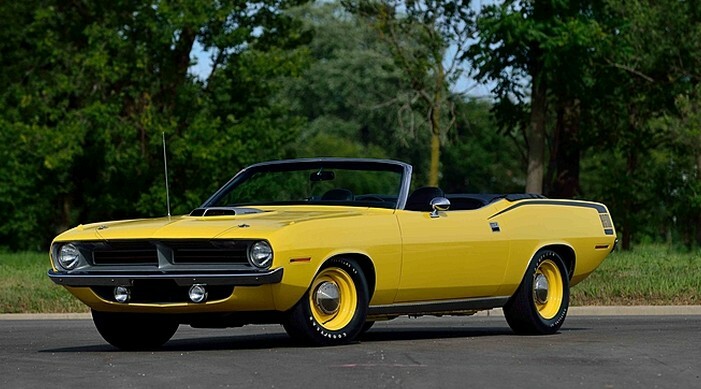 Hemi ‘Cuda Convertibles are among the rarest of muscle cars: only 11 were built in 1971 and only 14 were built in 1970. That Hemi is a 7.0-liter V-8 rated at 425 horsepower. This car is one of five (of the 14) equipped with a four-speed manual transmission. On top of that, this car is loaded with options and was sold new in British Columbia. It came back to the U.S. in 1999 and was restored. It’s covered a little over 27,000 miles in its life. Offered in factory-correct Lemon Twist paint, this car will easily break the million dollar mark. Click here for more info and here for more from Mecum in Florida. This entry was posted in Uncategorized and tagged 1970, auctions, cars, classic cars, convertible, cuda, hemi, mecum, muscle cars, plymouth by classiccarweekly. Bookmark the permalink.